Owning a dog holds great responsibility. You’re solely responsible for your doggy’s happiness, safety, and health! You know that every single decision you makes is hugely important when it comes to ensuring our dog has everything they need and one of the ways you want to provide the absolute best care is by buying the right pet food! You are probably wondering what the best grain-free dog foods are to feed your sweet, furry friend. Great question! Here are the 5 best grain-free dog food choices for you and your four-legged friend. If you’re looking for a dog food that agrees with your pup’s tummy, skin, and overall health, you’re actually looking for grain-free dog food. Many brands carry grain-free dog food formulas, but that doesn’t mean that all grain-free dog foods are the best for your furry friend. 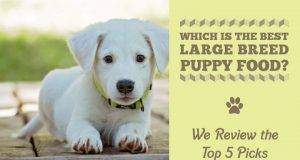 The list of the top 5 best grain free dog foods we have compiled for you will give you the best insight into which of these brands will be best for your dog’s needs. We like to look for the ingredients included, digestion ease, and added nutritional supplements to help us decide the quality of the dog food. As always, picking a dog food that fits your dog’s needs is highly important, but we have found that the ingredients, digestion ease, and nutritional supplements are top quality in all of the 5 dog foods we included here. 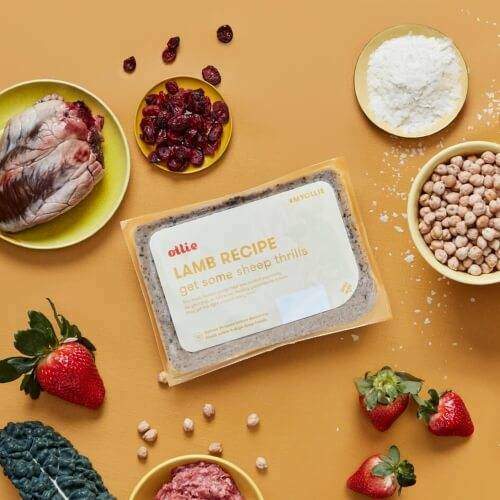 Nom Nom Now is made with restaurant-grade foods that you could eat if you wanted to, making it the perfect choice for grain free dog food as well as dogs with sensitive stomachs. 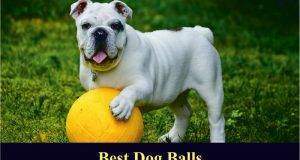 There are several recipes to choose from, or if your dog tends to get tired of eating the same thing day in and day out, you can go with a variety pack. At order time, you get the opportunity to consult with a veterinary nutritionist, who will help you choose the best food for your picky pup. We get it. Some dogs are really picky eaters! We’ve covered a few foods that have a great reputation for tempting even the finickiest hound, and now we’ve found something new. 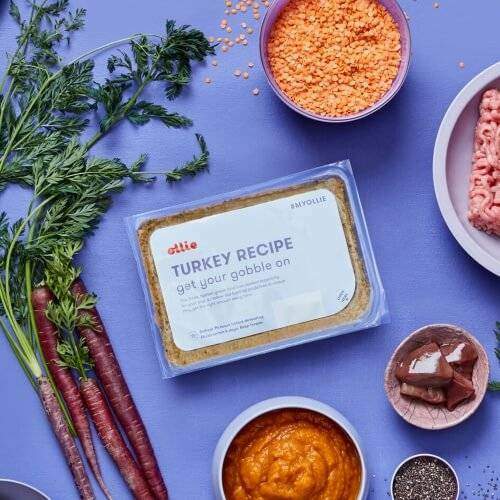 Like other choices that tend to meet the requirements for grain free dog food, Ollie dog food is made with fresh ingredients, and it’s also delivered fresh to your door, kind of like a grocery subscription, but for your dog. All the recipes have fresh meat as their first ingredient, and there are quite a few options to choose from, so you can keep your canine friend interested at mealtime. After all, how would you feel if you had to eat the same exact thing day in and day out? These recipes are nutritionally balanced, with a blend of vitamins and minerals designed with your dog’s health in mind. Fresh fruits, veggies, legumes, and wholesome extras like fish oil help keep your dog looking and feeling his best, from the tip of his nose to the end of his adorable tail. Every dog gets a specific meal plan based on nutritional needs. Meals are made with fresh ingredients sourced in America and Australia. 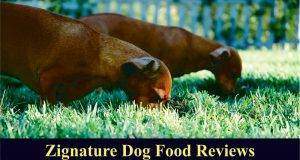 Recipes are formulated by vets with an eye toward great health and good, fresh flavor. Everything is cooked fresh at low temperatures, assuring nutritional integrity. Food is delivered fresh, with a special scoop to help you measure exactly the right amount at each meal. Tempting tastes convince picky eaters to dig in. If you dog doesn’t like the food, your first order is refunded. Many grain-free options to choose from. 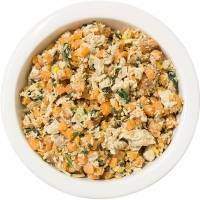 This is another hugely popular dog food brand with picky eaters that is widely regarded to be one of the best in terms of flavor, taste, and nutrition. It is one of the more expensive brands, so it’s best to see the purchase as an investment into your picky pup’s health and eating pleasure. 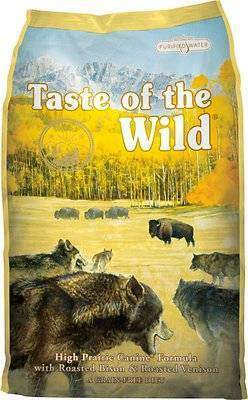 The Taste of the Wild Grain-free range is designed to reflect the local, regional produce available all over North America. So, the High Prairie variety contains a mix of buffalo, lamb, bison, and venison. As well as plant-based foods including sweet potatoes and a variety of berries. Frankly, those ingredients sound better than the way most humans eat. It is high in protein and low in carbohydrates, following the “biologically appropriate” model of dog feeding. 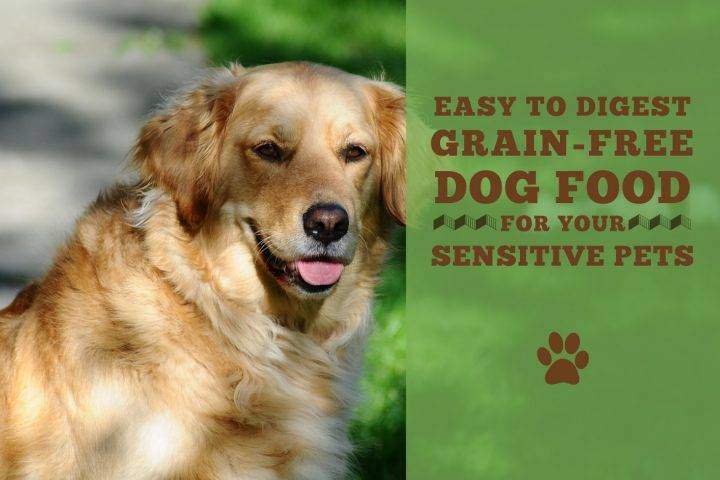 This product is 100 percent grain-free, though this doesn’t necessarily make it better for your dog unless they have an allergy. The guaranteed analysis shows a minimum of 33 percent protein and 17 percent fat. It doesn’t contain any artificial flavors, colors or preservatives and you’ll find that reading the ingredients, almost everything is easily identifiable, unlike some foods where you can’t decipher half of what’s in them. It is quite an expensive food, but it definitely contains high-quality ingredients and no hidden nasties. We’ve got yet another manufacturing heavyweight here with Nature’s Variety, which are known for their high quality, delicious and nutritious dog food. The food is actually freeze-dried, which keeps it moist and the flavors fresh – picky eaters won’t be able to resist. 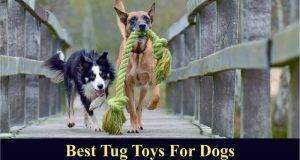 There are also added vitamins and minerals so your dog is getting all the right nutrients. These are chelated, which makes them more highly bioavailable. The guaranteed analysis shows a minimum of 34 percent protein and 12 percent fat. The large breed formula contains both glucosamine and chondroitin, which are beneficial for the joints and could help avoid some of the joint issues often found in golden retrievers and other big dogs. 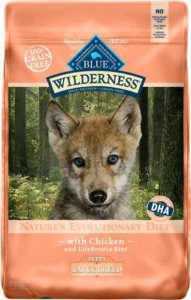 With complex carbohydrates from a blend of sweet potatoes, potatoes, and carrots, Blue Buffalo Wilderness large breed puppy food also contains antioxidants sourced from cranberries, blueberries, and blackberries, all designed to support your pup’s developing immune system. 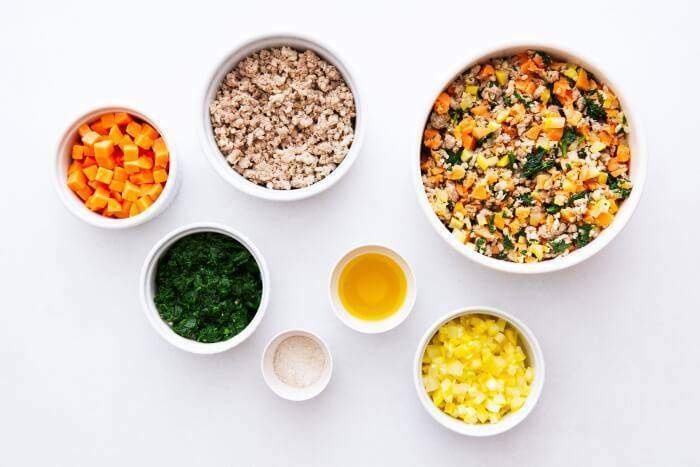 The blend has real chicken as its first ingredients, and it’s free from fillers like corn, wheat, and soy. Added vitamins and minerals help support healthy growth, and a combination of calcium and phosphorus assure healthy skeletal development for your large-breed puppy. 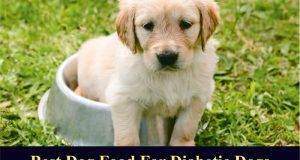 The kibble size is designed for puppies to handle with ease. According to the guaranteed analysis, the minimum protein content is 35 percent, and minimum fat content is 16 percent, which is more than sufficient for most dogs. 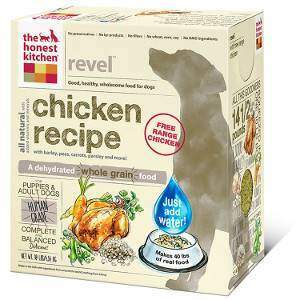 The Honest Kitchen is a relatively new and revolutionary dog food (and human food!) manufacturer that create products just as nutritious and delicious as the other foods on this list but in a dehydrated form. This means you need to add a little water to the formula before you feed it to your pup. 100% human grade – just like those table scraps! You really do have some great choices to choose from when it comes to a potato-free and grain-free diet for Fido. 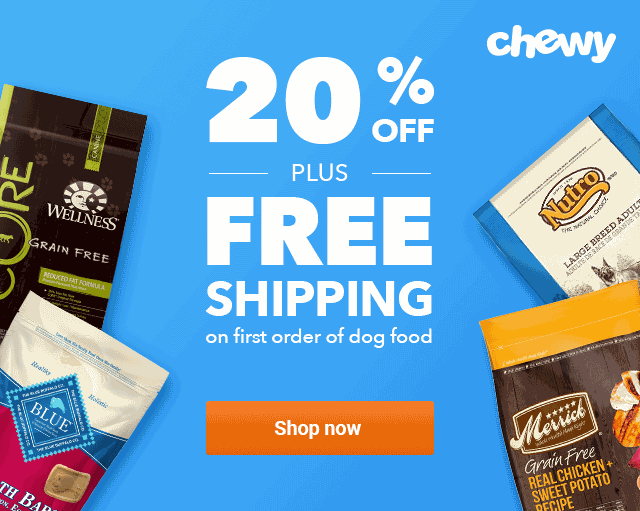 With foods for all stages of life from teeny pups to grown-up seniors, you will find a dog food for a grain-free diet that will be sure to have your pooch licking his chops before and after each meal. You know that when you provide your dog with the best grain-free dog food you are providing them with the top-of-the-line dog food that will give your dog the best nutrition they could possibly get! And the best part? You won’t have to break the bank when you buy one of these grain-free pet food choices. 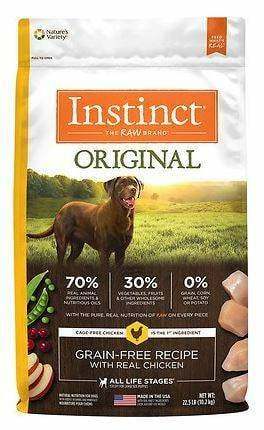 Each choice has all the right ingredients such as iron proteinate, manganese proteinate, folic acid, and Omega fatty acids, as well as being gluten-free to ensure that your dog remains healthy. Previous: The Miniature Golden Retriever – What is it Exactly? 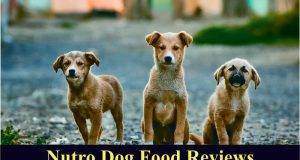 Complete Nutro Dog Food Reviews [ & Brand Overview]: Is It Worth A Try?